Jennifer says "I love everyone's excitement about posting and reading around in this monthly carnival. I know — it's a dangerous exercise, and I appreciate all of you who take the risk each month of exposing your to-be-read pile (which if it's anything like mine, doesn't always adhere to your goals). Even riskier, some of you are willing to read others posts, opening yourself up to finding even more lovely books worthy of attention." 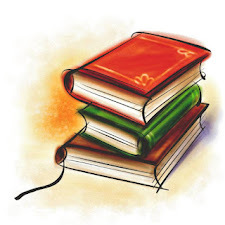 I have a combination of nonfiction and fiction books from several genres including christian, romance, mysteries, suspense, science fiction and classics. A little bit of this and a little bit of that. I've been trying to be good and restrain myself from buying more books until the majority of these are read. I've only added 3 new ones to the pile including Stephen king's "Duma Key", Hannah Alexander's "Safe Haven" and Debra Webb's "Find Me." However, my wish list has grown quite long. I am doing several challenges (see my list of books here, includes links to reviews) including Winter Reading Challenge of which I've read 16 out of 26 books so far. I'm concentrating on reading the books from my winter reading list, before moving to the rest. I just finished reading "Kiss" by Tedd Dekker and Erin Healy and thoroughly enjoyed it. Will be writing up a review soon, but just want to say it is well done, keeps your imagination engaged and the pages turning to see what is going to happen next. James received Mysterious Benedict Society from Santa for Christmas, but it looks like I'll be reading it first. 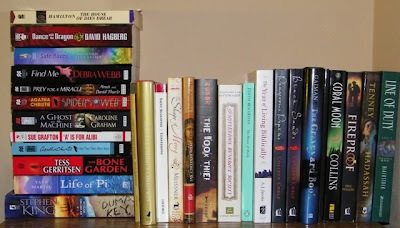 I picked up many of these books, such as The Book Thief and The Graveyard Book on recommendations from other bloggers. I've been reading books by Terri Blackstock for years, but Susan Meissner ("The Shape of Mercy"), Brandilyn Collins ("Coral Moon") and Colleen Coble ("Dangerous Depths" of the Aloha Reef Series) are recent discoveries. I picked up "Fireproof" after hearing about the movie and look forward to reading it. I picked out the classics "The House of Dries Drear" by Virginia Hamilton, "The House of Mirth" by Edith Wharton and "The Uncommon Reader" by Alan Bennett in honor of the Dewey's Book's Reading Challenge. I also have one nonfiction book (my water closet book - otherwise wouldn't find the time to read it) that I'm currently reading called "How to Read a Book" by Mortimer Adler. I picked it up a few years back and skimmed it, but never took the time to read it in depth. It is interesting and informative to say the least. So, what's on your nightstand? I was just reading about The Book Thief and I'm putting it on my TBR list. I'm also waiting for Fireproof to his my library. Happy Reading! That's the most books I've ever seen on a nightstand. The Book Thief is very good and An Uncommon Reader was fun to read. I'm doing a lot of challenges, including the Martel-Harper one. Thanks for visiting my blog. That is quite a pile of books on your nightstand! I'll be waiting to read your review of "Kiss" - it's on my list to pick up. My dh is a Dekker fan. Glad to see someone else's night stand looks as crowed with books as mine! Nice list of books coming up for you. You have some wonderful books! The Kanner Lake seris by Brandilynn Collins is so good as is The Book Thief. Happy Reading. Looks like these book challenges are pretty intense! The House of Mirth was the first book I read with my book club years ago. enjoy! 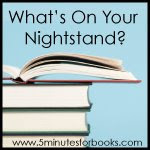 I love seeing all the books wedged into your nightstand! You've got some great titles going. I spy some excellent books there! I've never gotten much into reading late 20th century fiction, with the exception of some Stephen King. Life of Pi is one of my favorites as well. I've heard some excellent things about "How to Read a Book" and it's on my to-read list as well. I'd like to see what you end up thinking about it! Hahahaha, love your nightstand. It's overflowing! I should take a pic of mine before & after. Just realized I need a different system for my book order for reviews. Quite an eclectic selection of books you have! I do want to read Susan Meissner. Terri Blackstock has been a long-time favorite for me. I like Colleen Coble, too. Oh boy hanging around your blog each month could be dangerous. You have some interesting books mentioned in your post and who knows what else is on/in/around that nightstand that I can't see right now. 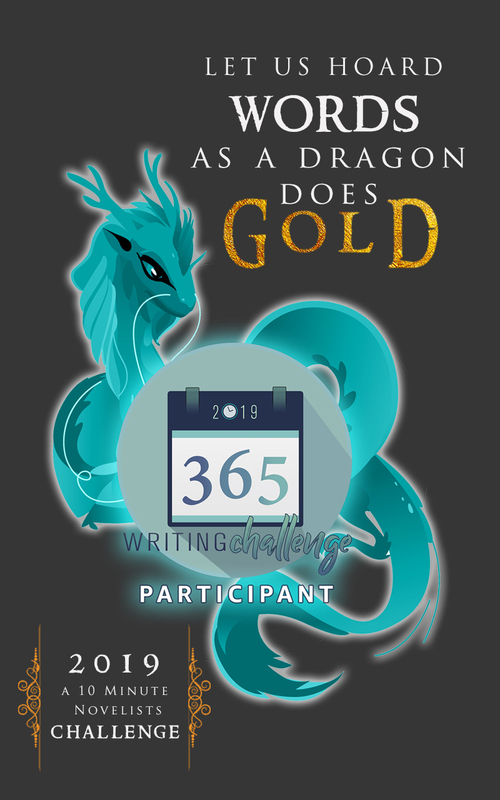 I'm off to check out your book challenges. That us one full nightstand! It looks like you have a lot of variety to keep you busy. Thats quite a stack! The 2nd picture has some books I loved (Mysterious Benedict Society being one of them) and some I hope to read as well (Life of Pi and Fireproof). There are some really great books on there and ones I wish i had on mine. enjoy!